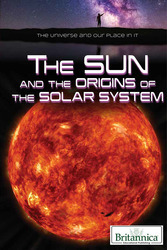 This intriguing book follows the Next Generation Science Standards focusing on the solar system and offers serious students of astronomy a detailed look at our Sun and the bodies that orbit it. Readers will learn, in detail, about the Sun's internal structure, including its energy generation, corona, the solar wind, sunspots, and solar flares, among other fascinating characteristics. They'll also study the solar system, which is fueled by the sun. This book is ideal for any reader who would appreciate detailed information for a school report, or who just wants to learn it on their own for more advanced study.